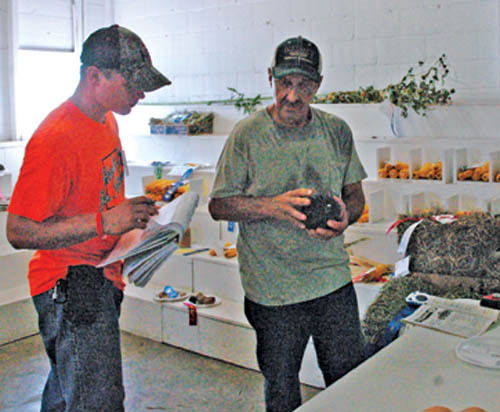 KENTON — Bud Bowers judged the vegetable entries Tuesday afternoon at the Hardin County Fair. He has participated at several county fairs including Van Wert, Allen, Auglaize and Hardin and served as an agricultural and horticultural superintendent at the 2015 Allen County Fair. Bowers claimed he became serious about produce when he entered 53 contenders and won 29 first places. As he inspected a squash he explained the requirements for a champion veggie. “First of all you don’t want any blemishes on here or any marks. You want the right shape, the right color,” he said, turning to hand over an entry to his assistant, remarking he would give it a first.